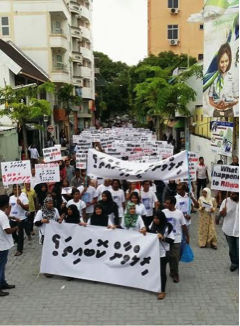 A private investigation by Glasgow-based Athena Intelligence and Security into the disappearance of Rilwan (aka Rizwan, @moyameehaa), a Maldivian journalist missing since August 8, 2014, has not led people any closer to finding him nor has it firmly established how he disappeared. Instead, the PI report has opened up the politics of Rilwan’s disappearance. Today, the interwoven complexities of gangs, religious extremism, politics and organised crime—and the incapacity of law enforcement to address these issues—cannot be ignored. Reaction of politicians, gangs and the Maldives Police Services (MPS) to the Private Invesitgator’s report—commissioned by the Maldivian Democracy Network (MDN) and released on Monday—emphasise these issues. It is starkly obvious in the long-drawn unproductive “search for Rilwan” by the MPS, as much as in their reluctance to speak with or meet the press. The PI report, in fact, has very little new information to disclose. From CCTV footage where Rilwan is last spotted and material already in public domain, the PI identified Ahmed Shiran Saeed and another unnamed man, both said to belong to Kuda Henveiru gang as suspects in Rilwan’s disappearance. Video showing “evidence of possible hostile surveillance being undertaken by two known gang members” is cited as evidence. Ibrahim Firaq and Aalif Raoof (Arliph Rauf) are named as owners of the only two cars registered in the Maldives that fits the description of a car involved in an abduction that reportedly took place outside Rilwan’s residence at the approximated time of his disappearance. MPS had earlier revealed that two cars had been brought under police custody in relation to Rilwan’s disappearance, but later denied Rilwan was the victim of abduction. There is no report of any other person who disappeared without trace at the time or on the date of Rilwan’s disappearance. So far MPS has not provided the identity of the victim of abduction. 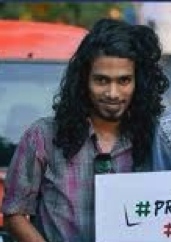 A fifth man named in the report is Ismail Abdul Raheem, a known extremist previously involved in religiously-motivated violent attacks, who had reportedly stalked Rilwan earlier. No direct connection to Rilwan’s disappearance is noted. The report draws no conclusions except for ruling out suicide or voluntary disappearance. On motives, too, the report has no conclusive information, and considers the possible involvement of major criminal gangs, politicians and religious extremists, referring to available information and past activities. Three gangs, Buru, “Bosnia”, and Kuda Henveiru are named as possible sources to follow-up. The report cites a series of recent “abductions” of the administrators of a Facebook group called “Colourless”. These cases were not reported to MPS by the victims though they have shared their experience on being invited to speak. They were harassed, intimidated and at least one was physically man-handled by gangsters and religious extremists working together. The alleged gang leader, Muaz, has not denied being involved, in fact he justified his action to his comrades as a “deserved shaking up”. 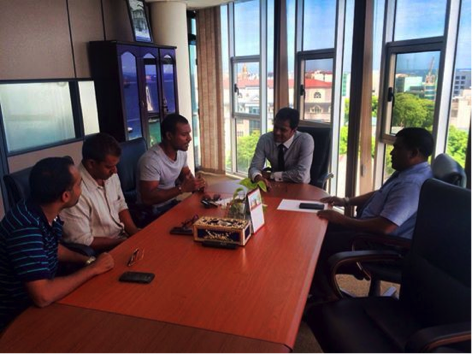 Following the Subject’s disappearance, in August 2014, it was reported that Ahmed NAZIM, the former Deputy Speaker contacted this reporter and informed him that the Subject had been working on a story to expose the TM [Tourism Minister Adeeb], for corrupt activity. 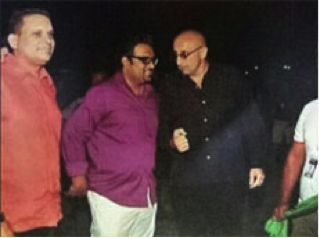 It was suggested that if Haseen were able to link the Subject’s disappearance with the TM, NAZIM would provide him with evidence of the TM’s corruption. The public alliance of Defence Minister Mohamed Nazim and Tourism Minister Ahmed Adeeb and their shared antagonism of Home Minister Umar Naseer is also noted. 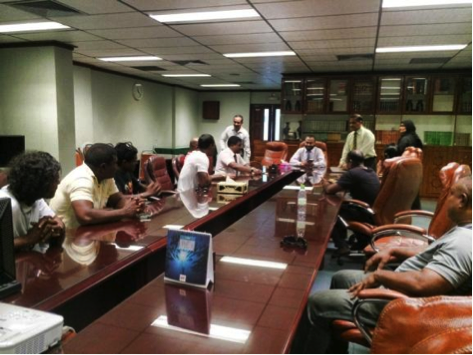 Further, Islamic Minister Mohamed Shaheem and Home Minister Umar Naseer are named as having met gang members led by Muaz Hammer aka Gut Mua who is said to have initiated the meetings to discuss their concern “on the growth of secularsm” in the Maldives. The so-called religiously motivated “abductions” of the “Colourless” administrators took place after these meetings which were reported by the Government as “concerned youth” having met the ministers. The PI report notes they had no access to forensic evidence, and is predominantly based on information from unnamed witnesses and stakeholders gathered from field research using the snowball approach and the cross referencing of these. The purpose of the report, as stated, is “to balance theory and conjecture with fact”. The investigation has determined that no one saw Rizwan in Hulhumale’ after 0000 hours on the 7th of August 2014 and that he did not speak to anyone either. CCTV footage shows him entering the Hulhumale’ Ferry Terminal in Male’ at about 0055 hours on the 8th of August and an individual told the Police that they spoke to him while on the ferry. The Police have not found any conclusive evidence linking Rizwan’s disappearance to the incident which occurred near his home on the night of the 7th and the fire in Hulhumale’, which took place on the 15th of August has not been linked to the case either. Additionally, the Police have summoned and interviewed other individuals caught on the CCTV footage of Rizwan that night. About 1235 hours of footage from 157 cameras from 79 locations have been obtained and is being analyzed and the footage points to him last being seen at 0055 hours on the 8th of August at the Hulhumale’ Ferry Terminal. Additionally, 521 minutes of dives have been conducted and a total area of 267197.5 square kilometers have been searched under water, along with 84 vessels. 9 places of residence in Male’ have been searched and about 139 locations in Hulhumale’, including places of residence, warehouses and garages, have been searched. Some guest houses in the islands are also being searched. A total of 128 individuals have been questioned and had their statements taken while 387 individuals were questioned and had information recorded, along with 192 individuals who lived in 77 apartments in Hulhumale’. Earlier, on September 4, 2014, MPS had revealed two cars were being held with Court Orders in case of disappeared journalist and forensic samples were to be sent abroad for testing; and that passports of four individuals were being held. On Tuesday evening, MPS reacted strongly to the PI report with a loaded and highly political 13-paragraph press release. The Police statement declared MDN had acted irresponsibly, with intent to mislead the public and to achieve a specific political purpose. It went on to say MDN had committed a “lowly act” with the purpose of defaming certain politicians, and that it intended to shape public opinion a certain way. It also said MPS had formed a special task force and was investigating Rilwan’s disappearance. The statement condemned MDN revealing the identity of suspects saying MDN had violated the human rights of the said individuals, diminishing their human dignity, creating public hatred against them and putting their safety at risk. MPS also noted that the said individual had “already lodged a complaint asserting MDN release of their personal information had put them in danger”. It further stated that MPS had noted “some parties are attempting to gather information on the ongoing investigation of MPS through Rilwan’s family and others”, and went on to declare that MPS did not believe that the PI’s work, carried out “in the name of searching for Rilwan” with the backing of some persons, was a legitimate activity. It also declared that the MPS will investigate the investigation, and take necessary action against “those behind” the PI report. MPS also noted they are professionally trained in advanced countries, naming United States, United Kingdom and Australia, and asserted that they follow international best practice in all investigations and are proficient in investigating crimes ranging from petty crimes to terrorism. 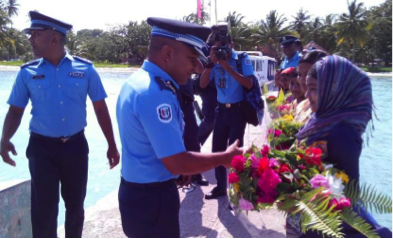 Last Sunday, following MDN’s announcement of the pending release of the PI’s findings, Commissioner of Police Hussain Waheed—who at the time was visiting Haa Dhaal Atoll with all the pomp of a politician—appeared to be reacting strongly against the #FindMoyameehaa movement led by friends and family of Rilwan. Addressing the community, CP Hussain Waheed criticized the public demanding action from Police and is quoted as saying “MPS will not be swayed by people’s demands” and “MPS must not be infenced by any person or a group of persons”. Indirecty he referred to a public rally, #SuvaaluMarch (or Question March), led by family and friends of Rilwan demanding answers to questions related to the police investigation into the disappearance of Rilwan. Opposition leader, former President Mohamed Nasheed, and some senior politicians of Maldivian Democratic Party (MDP) had joined the rally to which family of Rilwan had personally written and invited all major parties to join. MPS response to President Nasheed’s interview to The Independent (UK) was similar, where instead of being concerned and attempting to investigate MPS chose to categorically deny Nasheed’s claim of extremism in the security force in a press release on September 18, 2014. The statement went on to appeal to Nasheed not to defame the security forces “for popularity or public support”. 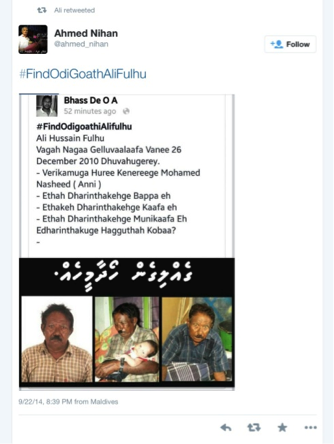 Following the release of the PI report, the parliamentary majority leader, MP Ahmed Nihan of the ruling Progressive Party of Maldives (PPM), publicly ridiculed the #FindMoyameehaa effort with a tweet mocking the attempts to find him and belittling Rilwan’s disappearance. He then went on to shamelessly defend his action despite the wording on the poster he tweeted which contradict his claim it was an innocent act, and argued: “Parliament have done its part by probing the matter through its proper channels. 241 Committee deliberated.” Online supporters of PPM carried the same line, mocking and taunting those concerned about Rilwan’s disappearance. In fact, the parliamentary 241-Committee mandated to look into national security services, a permanently closed committee without access to media or public is reported to have passed the case of Rilwan’s disappearance, raised by the opposition Maldivian Democratic Party (MDP), to a sub-committee. The sub-committee has issued no reports and the 241-Committee has not convened since. 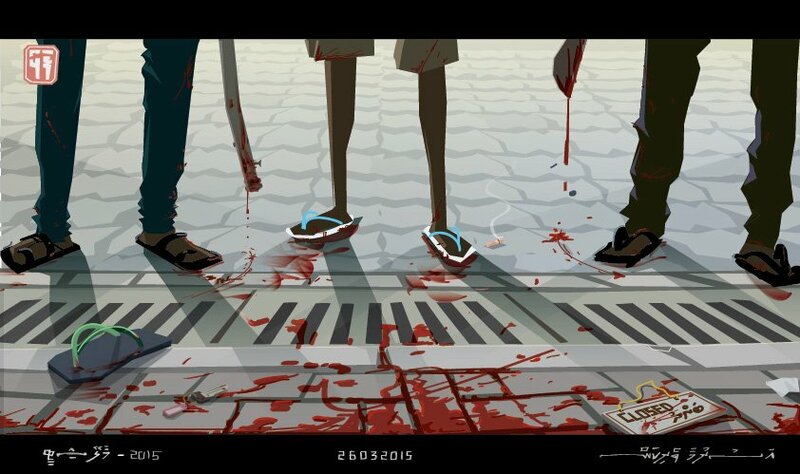 Overnight, new twitter accounts sprung up to harass those who speak up to find Rilwan. 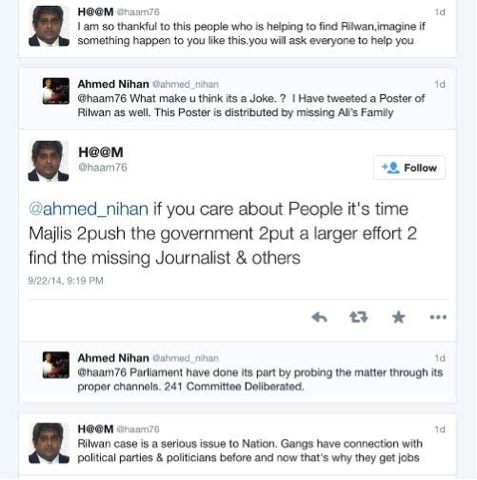 This is in addition to the regular supporters of government online who continue to see Rilwan’s disappearance a laugh. President Yameen Abdul Gayoom who has previously refused to comment on Rilwan’s disappearance remained silent, as did the Home Minister Umar Naseer who was outspoken on gangs, drugs and serious crime and their connection to President Yameen in the lead up to 2013 elections. Nasheed, meanwhile, accused leaders of Adhaalath Party, Islamic Minister Mohamed Shaheem and Sheikh Imran of radicalizing youth and promoting extremism through indoctrination and encouragement of vigilante action in the name of Islam. Nasheed went on to claim Rilwan is believed to have been abducted by a radicalised youth. “Don’t do this to our youth. Don’t make them do all these vile deeds after picking them out individually and leading them astray,” the opposition leader appealed at an MDP rally in Male’ coinciding with the release of the PI report after the scheduled open air rally had been postponed twice due to bad weather. Meanwhile, Executive Director of MDN, Shahindha Ismail and lawyer of Rilwan’s family Mushfique Mohamed are openly receiving threats, and it requires huge imagination to envision MPS acting on these threats to guarantee the safety of their targets. 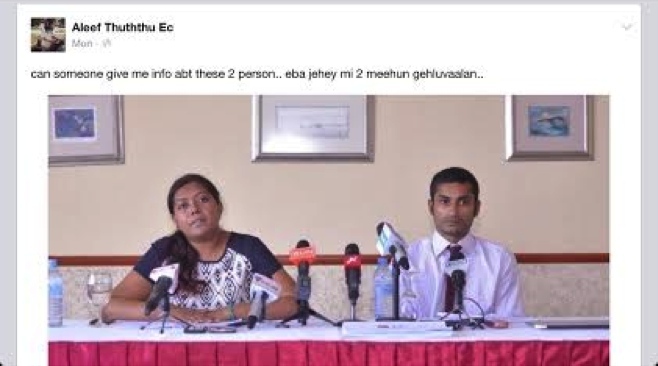 “Aleef Thuththu Ec”, seen in the photo below asking for information on Shahindha and Mushfique saying “they need to be disappeared”, is said to be a brother of the Aalif named in the PI report as registered owner of one of the red cars. 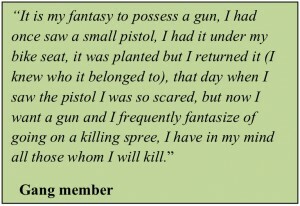 A rapid assessment of gangs in Male’, published by Asia Foundation in 2012, estimates between 20 and 30 different gangs are active in Male’, an island barely 2.5sq.km in total land area, surrounded by the ocean. 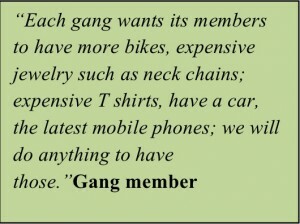 It is estimated that there are 50 to 400 members in each of these gangs. 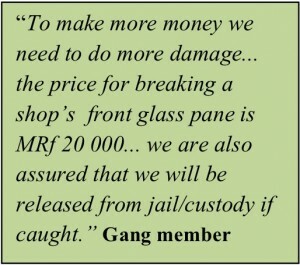 Income for many of these gangs are said to come from “exchanges with political actors or business people.” The report found payment is usually in the form of money, but that sometimes alcohol would be provided for gang services such as participation in political protests, starting political riots, destroying property or injuring a third party. “Money is often given to a gang to initiate a fight so as to divert attention from a political issue”, the report states. Politicians or businessmen generally only deal directly with the gang leader and the amount of money exchanged is known only to the gang leader. The member who carries out the contract receives a small portion of the money. 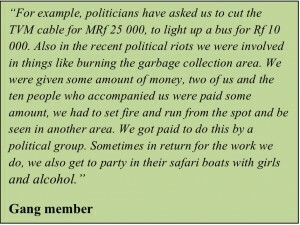 Leaders can sometimes get a monthly income of up to MRF 1 million (USD 65,000) for being on call to carry out a politicians ‘dirty work.’ In extreme cases gang members are given contracts to carry out murder. One member said, “We may be given a file with all the information about the person and be told we may be paid in millions to carry out the killing.” ~ Rapid Assessment of Gangs in Male’, 2012. The report found gang members had protectors or patrons among powerful politicians who guaranteed law enforcement agencies will leave them alone and that they would be saved from Courts where necessary. A co-dependency is said to exist as gang leaders are aware of illegal and criminal activities of politicians and each depend on the other to achieve their ends. The PI report, the updates provided by MPS on the “ongoing search for Rilwan” and the language and sentiments expressed in other related statements of MPS, and the indisputable fact that it is now nearly 50 days since Rilwan disappeared, gives serious reason for concern about the police investigation. Of immediate critical concern is the unknown situation of Rilwan as the reported “search” by MPS continues without any visibility of such an activity or meaningful updates. Rilwan’s disappearance, the circumstances surrounding it, the researched yet never addressed relationship between gangs, politicians and crime, and the influence of politics and politicians on law enforcement inclusive of police and the judiciary, makes the situation in Maldives today terrifying. Worse is there is no functional mechanism within the State to stand up to these issues and say, enough is enough. Current Commissioner of Police in 2013 had tweeted, ‘Police forms a Gang Task Force to prevent and eradicate violent criminal activity. Zero tolerance for gang activity!” but gang crime and the brutality of violent crimes has risen sharply, with stabbings and murders common. Rilwan’s abduction, a crime like no other before this, may not be the last given the criminal environment and the fact that perpetrators of serious crime rarely face justice. Despite the statements of MPS to the contrary, serious crimes have sharply risen with 31 murders recorded since 2001, ten murders 2012 alone which include the brutal torture and murder of lawyer Ahmed Najeeb and the violent hacking of MP Dr. Afraasheem Ali. A record 27 of these 31 murders remain unsolved. Crime statistics available on MPS website show crime had been steadily on the rise since 2000, and had decreased by as much as 12% in 2010, rising again 5% in 2011 and 15% in 2012. Not least among concerns is that MPS may be unable, or unwilling, to investigate Rilwan’s disappearance or address serious organized crime. It may indeed be politics, and the involvement of powerful individuals within or with links to Government is preventing MPS from being professional. Just as gang leaders depend on influential politicians, senior law enforcement officials too depend on powerful individual politicians upon whom their livelihoods depend. When crime rules and silence pays, few would be willing to break out and put their lives and livelihood at risk. They are the fools.